To use this thread, and destroy any fabricated or misuse of a scan/claim, through formal explanation and backings. In the OBD early years, we where brought to believe many things. One of the more sinister internet myths was Superman Prime owning The Sword of Truth. It was brought to an end, when several members brought forth an argument that S. Prime never held the sword in any showings. And that the myth originated when 3 items (among the them SoT), where seen on the cover of the comic book. Currently there are several respect threads, that misuse a scan’s fear or inserting a quote manipulation. Members pick up on these, fabricated claims and horribly spread un-weighted claims. Instead of attacking and spamming individual threads. I will simply put my claims in this topic . Onslaught beats Jean Grey with the "Phoenix Force". The scans that are used in the claim. What claimer fails to mention, acknowledge, or is where of. Moments before the encounter, Onslaught attempts to persuade Jean to join him by promising to rekindle her former glorious power (albeit the Phoenix Force). I really should not go any farther then that, but for some members its not clear enough. Do not be fooled by Phoenix Effect, it can and has bin replicated by other members in the material world (Nate Grey and Exiles Hyperstorm come to mind). Let alone the fact, that they are in the “Astral Plane”, where elaborate holograms, and astral projections are easy to form. In X-Men Forever (January 2001) - under the threat of “The Stranger”, Jean still did no have the Phoenix Force with her. Jean did not begin to manifest the Phoenix Rapture until New X-Men #120 - Jan 2002. The Verdict - Mythbusted - False. Onslaught never beat Jean with the Phoenix Force, since The Phoenix Force did not reside within Jean to begin with. Yes Jean took on the CODE NAME, Phoenix but it’s a code name to honoring Rachael request. Incidentally the Phoenix Force does return back to Jean, after 8 years after Onslaught incident. I think the whole OE doesn't work on Superman because he protected by the source should be investigated..
Not particularly. It is an In-canon explanation for why Darksieds Insta-kill power doesn't work on DC's flagship character. Awesome idea. And maybe after a few dozen good myths we can repost the thread with the analyses at the front of the thread. How far are you going to go with this? Because there are so many instances where people go off a single page or even a single panel not knowing there are critical components they are missing from earlier or later in the comic or arc. I move that MrMaster and GS not be allowed into this thread ever. I have nothing against either one but this is the type of thread that attracts their arguing, which would bury everything else. Anyway I think an analysis of Thanos' fight with Champion where people say he mentions that he "fears the Hulk" deserves an analysis here. Thanos is scared of the Hulk. 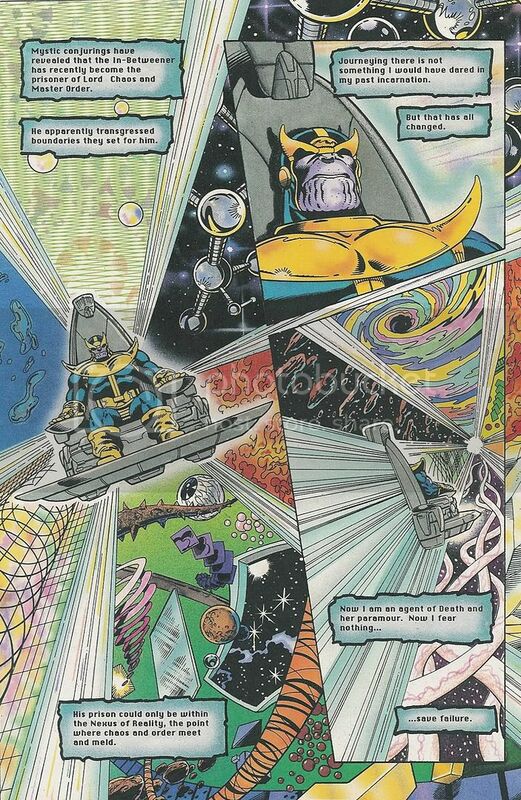 Now, all Thanos says is that he has avoided this battle, or sought to avoid. It never says he's scared of Hulk; it's more along the lines of: "I'd fight him, but I'd rather not." 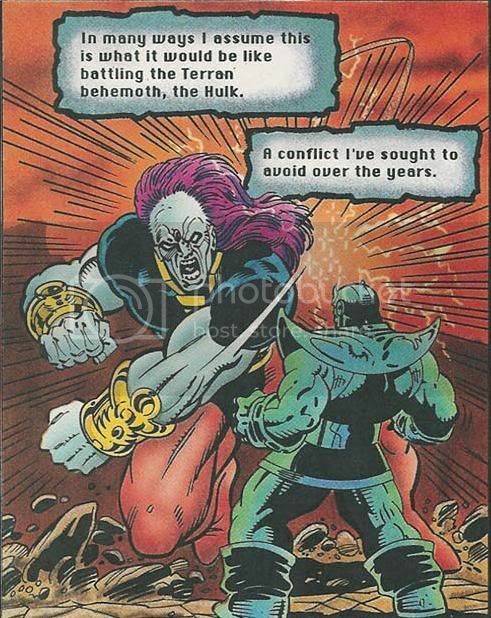 Now, this is also before Thanos had actually ever met Hulk as well, and before his upgrade(s). Thanos didn't know him, or know his power... he just heard the hearsay I guess on Hulk. It's incredibly hard to judge something based on that, and based on the hearsay of Hulk... a lot of people would avoid a battle with him as well. 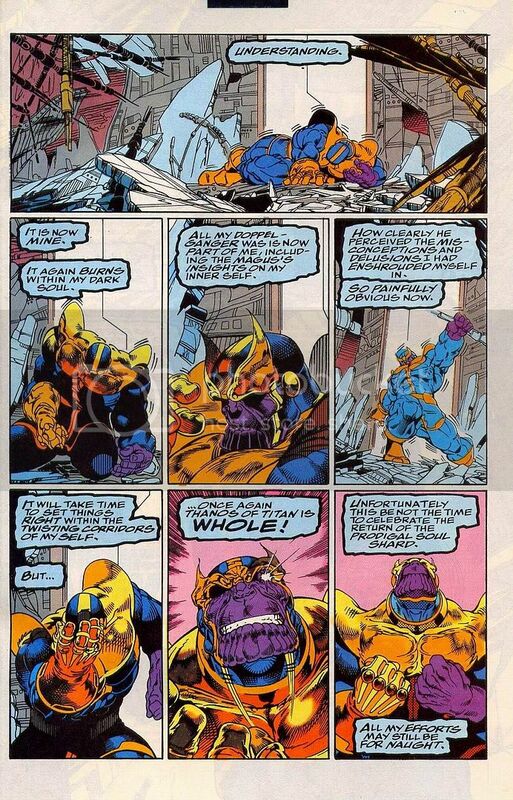 Also, after his upgrade Thanos did something in particular that pertains to this, that he would never had done before. Plus, even if he did fear Hulk as the myth has led us to believe, it's incredibly off base for Thanos, and his history. He's fought Galactus, Beyonder, Odin, Tyrant, and beings of that nature. Of course this is after he was re-incarnated, which could mean that it might be OK in a debate against Pre-Hat Thanos, but not Thanos after he was brought back. Also, the most visible part of this myth that the people who use this fail to see, is that he says that Champion is akin to fighting Hulk, and he would rather avoid that battle... but at the same time he went into battle with Champion. Which would be like going into battle with Hulk. Which, on its own would rule out Thanos being scared of Hulk. These first two parts of Hulk/Thanos are from 'Infinity War'. 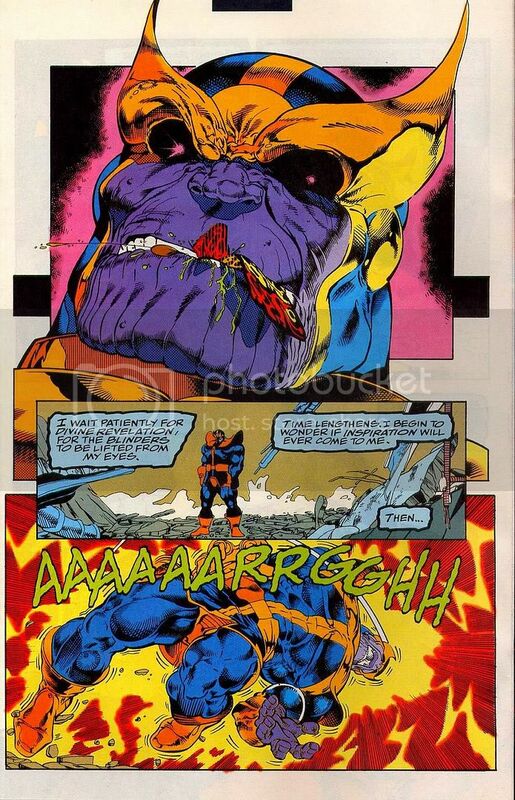 What is relevant about this, is that Thanos was weaker in this series. He was only at about half power, or he got a power up (either one makes him weaker than he is now). He insults Hulk, when he has his own back turned. Thanos and Warlock do it in one shot. What's the first thing he does? Go after Hulk and Thing, insulting them. "Strange, leash your dog, or I will." He is so scared of Hulk... he gets between him and Namor, and puts them both in bubbles they can't break out. Thanos clone. And this one I believe is the one from Kazar... which would make him a low level Thanos clone. The funny thing is... that he was actually planning on giving HULK POWER. 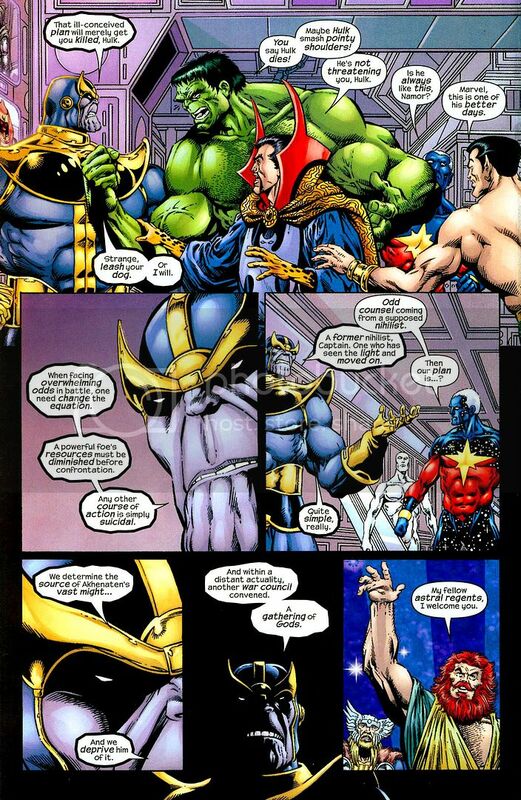 Now, everything about Hulk/Thanos points to Thanos having no fear of Hulk. The only way this myth can be relevant, is if Hulk was fighting Post resurrection Thanos, and even then, fear/avoiding a battle doesn't equate into you being weaker than the opponent. This is one of the most annoying things people say, and IMO at least, this is totally busted. Co-sign with Sym. Mr. M and GS would bury this with their cosmics arguements. We technically can't block members from posting, so the idea about Master and GS will have to remain just a suggestion. I would hope that they'll be able to stick to protocol, see that this is a promising thread, and not overwhelm us with their debates. But they're certainly welcome to contribute, just so long as it remains as brief and respectful as possible. Thanks for the approval. It seems that many of the popular claims, go with out reading through the material and just looking at the scan (I will admit, I have done them plenty of times). However, I do think this thread could stare some controversy. Let it be out of fanboysim or different point of views. Note: Cable beating X-Man, gets on my nerve. I think I’ll do this one next. I'd do the myth of "Apocalypse being an equal or greater telepath than Xavier." but that's already been outlined and busted in multiple threads. Might be worth a repost. Anyway, I have 1-2 I can contribute too. One from Authority and one for Spider-Man. And it's kind of unfortunate how some respect threads are run these days. Our respect forum is great, so I'm not complaining, but occasionally you get the "what can I get away with?" mentality rather than just trying to show what someone is capable of and what their limitations are. "Capability" threads are probably better than "respect" threads, if only because the name suggests a slightly different intent....informing others rather than boosting a character's rep.
Oh, and as long as we're suggesting things that should stay out of this thread, I'm making a quasi-official rule that Storm stuff isn't allowed. No freaking way I'm letting that idiocy take over this thread. And people should also feel free to validate myths if they are true as well. This thread can run both ways, so long as the analysis is thorough and as objective as possible. The myth of "Apocalypse can't defeat the X-Men" is better. I think you should do the "Rachel Grey has been cited an Omega Level Mutant" myth since you were the one who busted that.